The technology behind Kinect is not something that Microsoft thinks anyone will easily develop a successful competitor to. Despite the explosion in the world of motion gaming, Kinect Creative Director Kudo Tsunoda thinks Microsoft has an ace in the hole. Tsunoda recently called Kinect something that was "really hard" to develop, and said the power of Microsoft was one of the reasons it was able to come together. In an interview with Eurogamer, Tsunoda said: "I think what we've done with [Kinect's] software is something that's really hard to pull off. We have a good advantage at Microsoft because we have groups like our Microsoft Research department that not a lot of other companies have, and we're able to solve some super-complicated technical problems in a short period of time." Tsunoda doesn't believe that it'll be possible for any other company to replicate Kinect without Microsoft's know-how. He thinks it'll be "super-challenging for anybody else to solve those problems." 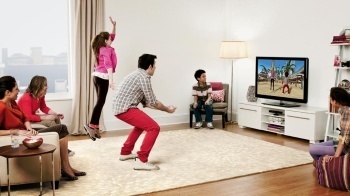 Even if someone does come up with a Kinect competitor, it might be too late. "People have been trying for a long time and we're the first company that's been able to deliver this," he says. "If people are able to figure it out ... by the time they've figured it out we're going to be off into adding more new things to the platform. But I just think that's such a hard technology challenge that it will be hard for anyone to deliver on what Kinect is." Does this mean Lenovo's Ebox has no chance to compete? One of the "things" Tsunoda hopes to add in future Kinect games is the digitization of real-world objects first shown off in Kinect's original demo-reel. Kinect might seem a little fluffy right now, but its software should continue to evolve to stave off competitors, according to Tsunoda.